A competition was launched in September 1996 with the aim of finding New Zealand's wackiest letterboxes. From Canterbury to the Coromandel, and from Wanaka to the Wairarapa proud mailbox remodellers sent in photos of their creations, in the hope of getting their letterbox on a stamp. 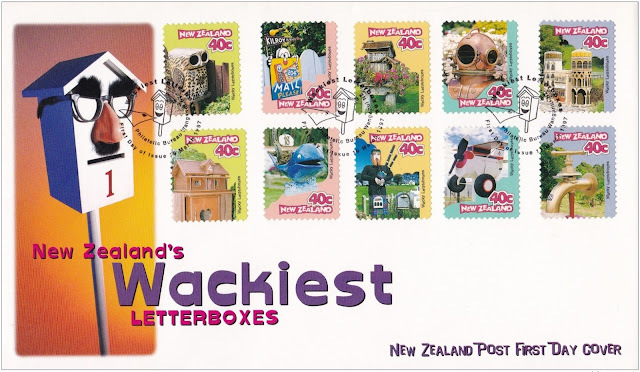 Over 300 entries were received from which ten letterboxes were finally selected. The winner had to be interesting, creative and out of the ordinary, but also had to be "postie-friendly" and practical. 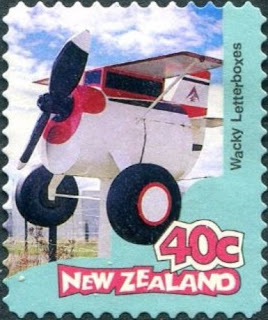 Ten winners were selected to appear in a special booklet of 10 40c stamps. The stamps were also available on a sheet as well. 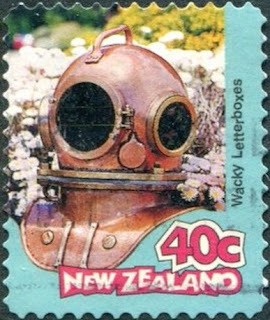 We have not been able to find good mint images so for something different we are displaying used stamps. 40c - Log Cabin / Timber House with Heart Shaped Door / Rangiora (Used). 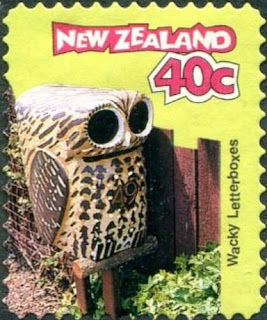 40c - Owl / Auckland (Used). 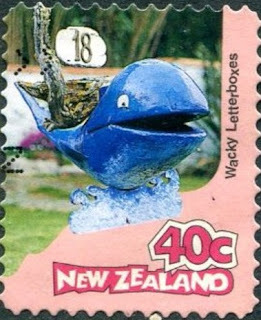 40c - The Whale / Mapua (Used). 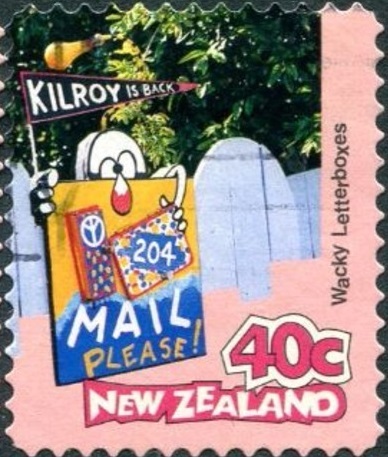 40c - Kilroy is Back / Auckland (Used). 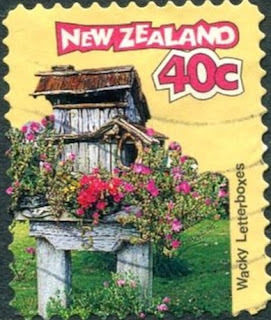 40c - Recycled Timber House with Flowers / Rotorua (Used). 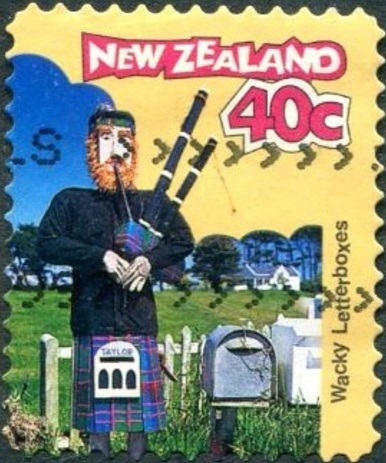 40c - The Highland Bagpiper / Patea (Used). 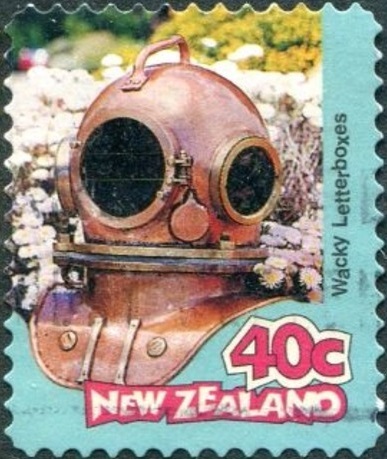 40c - Divers Helmet / Nelson (Used). 40c - Bi-Plane / Wanaka (Used). 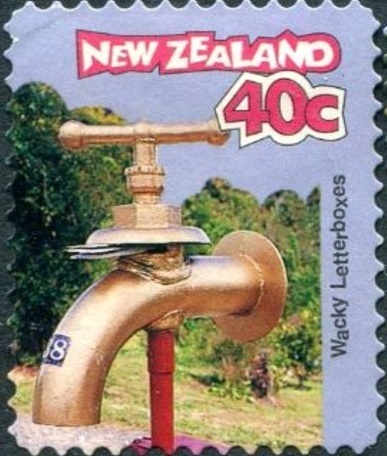 40c - Gold Tap / Waihi (Used). 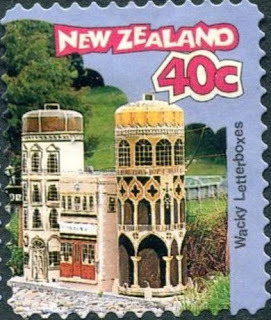 40c - Ornate Castle / Masterton (Used). $4.00 - Self Adhesive Booklet of ten 40 cent stamps. $4.00 - Self Adhesive Sheetlet of ten 40 cent stamps. First Day Cover - 19 March 1997. Date of issue: 19 March 1997. 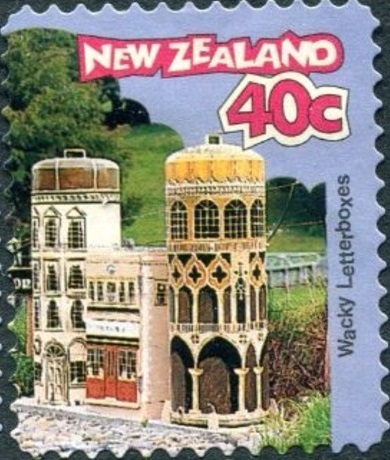 Stamp booklet and first-day cover designed: Communication Arts, Wellington, New Zealand. The number of colours: Four. Stamp size and format: 25mm x 30mm vertical. 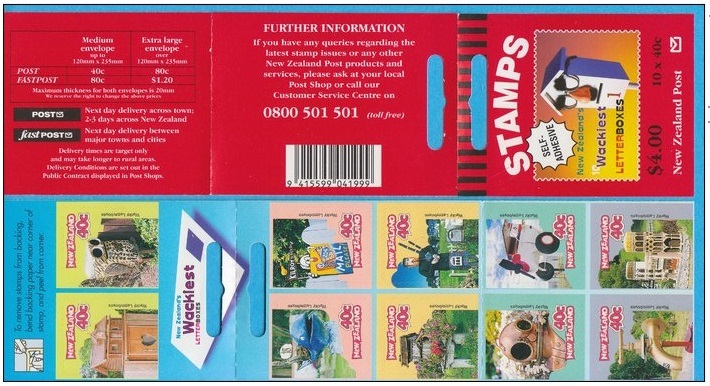 Sheet size: 10 stamps per booklet. Process: Lithography with stochastic screening. Paper type: JAC self-adhesive stamp paper, red phosphor coated, unwatermarked. Special blocks: Due to the booklet nature of this issue, sheet, plate/imprint, positional, value, barcode and colour blocks were not available with this issue. 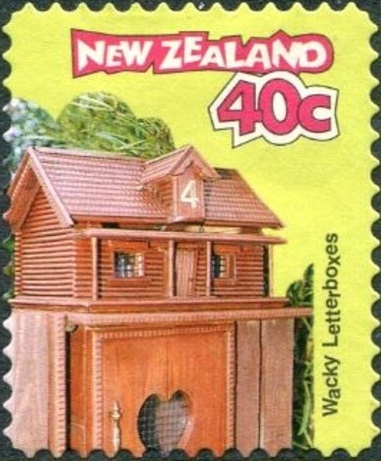 Period of sale: These stamps remained on sale until 19 March 1998.